MICAM Ltd was selected in 2017 by the Dublin Airport Authority (DAA) to supply its innovative Horizon wall lining system to a series of new and upgraded areas in both Terminal 1 and Terminal 2. 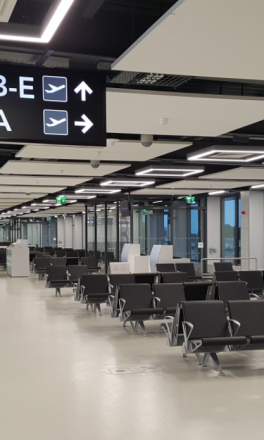 The €22m South Gates pre-boarding zone is a new open plan 120m x 20m building adjacent to Terminal 2 which opened in October 2017. It will be used mainly by Aer Lingus for flights to the UK and continental Europe and has five boarding gates serving nine aircraft parking stands. At peak occupancy this new building can hold 863 people, with over 8,000 people passing through each day at Europe’s fasting growing airport. This new area features the MICAM Horizon wall cladding in attractive silver grey and cobalt blue colours. The MICAM Horizon wall lining system is based on a unique high performance glass-reinforced composite panel with an integrated slim-line anodised aluminium framing system with matching stainless steel skirting and corner details. The system was selected for its fire performance, durability, ease of installation and compliance with the latest airport security guidelines (ASIAD). Further installations of MICAM Horizon are planned for Dublin airport during Q1 and Q2 2018.